What is it with me and food trucks? I seriously can’t get enough of them! In the Row Home Eats household, our Sunday tradition (at least between the months of May-November) involve waking up and heading over to the Headhouse Square Farmers Market while listening to brunch with the Beatles. Dog in tow, of course. We used to do our shopping for the day then hit the Renaissance Sausage Truck and munch our sandwiches on the cement stairs adjacent to the shambles. My favorite was the vegetarian while my husband usually opted for the Mediterranean. But alas, a few months ago I stumbled across some alarming news. The Sausage Truck would be closing! We were sure to visit Headhouse on their last official Sunday and split a kielbasa in sadness as we wondered who could possibly fill their big, big shoes. Around this time, another truck began to make a name for itself in the Philadelphia area. The Latin Farmer debuted at the stupid Mt. Airy Night Market where I couldn’t find a stupid parking spot after driving all the way up there in rush hour traffic. Nah, I’m not still bitter. 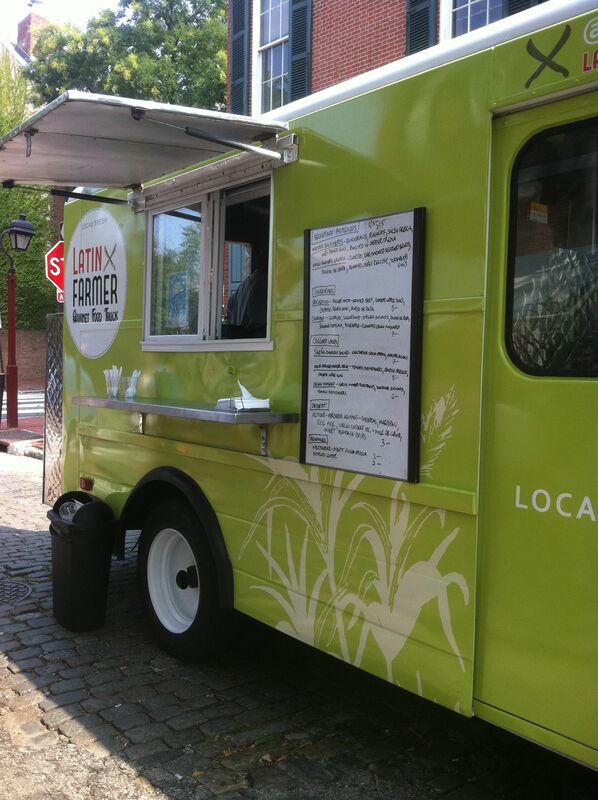 The Latin Farmer promoted healthy, local eating and had an eco-conscious truck to boot. I had to check this place out. 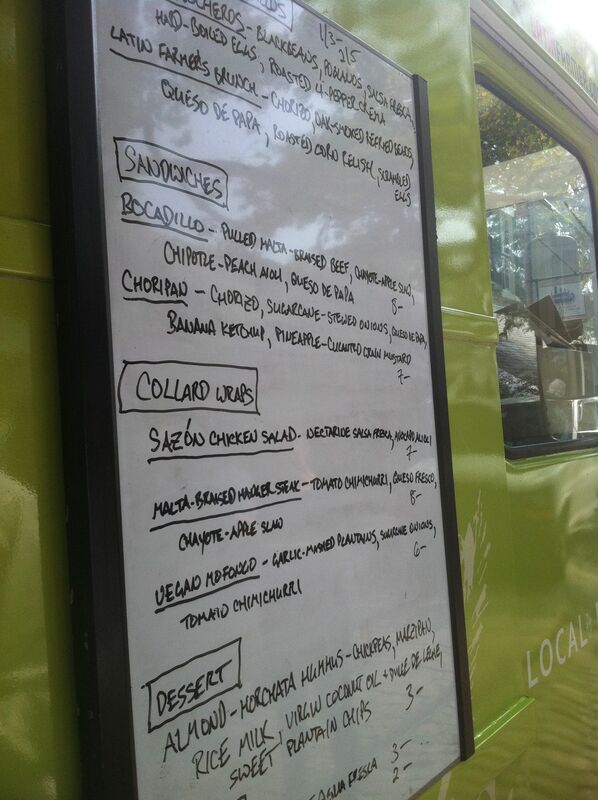 We checked out the menu and I was drawn to the chicken salad but couldn’t quite wrap my head around the collard wraps. I do love me some bread. My adventurous husband chose the steak collard wrap while I ended up with the braised beef sandwich, the bocadillo. The collard wraps were pretty adorable, I must admit. For $8, however, it was a bit shrimpy. Luckily, reports were glowing. The steak inside was well-seasoned and the salsa was the perfect sweet accompaniment. The bocadillo looked pretty hearty in comparison. 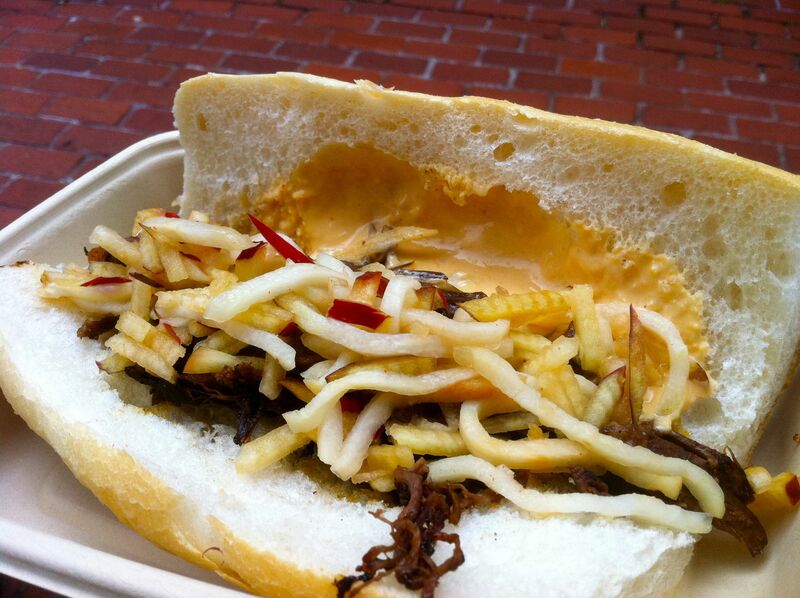 Surprisingly, the highlight of this sandwich was the crunchy apple slaw that sat atop the braised meat. The crunch played well with the soft and chewy meat and gave it a great tang. I must say, and it’s funny that I’m complaining after whining that the collard wraps had no bread, that the bread to filling ratio in the bocadillo was a bit off. There was just too much bread for this sandwich and it overwhelmed the filling, which should have been the star. While I miss the Sausage Truck, who will always remain near and dear to my heart, I’m happy to say the The Latin Farmer has found a home. Unfortunately, since that Sunday, the Latin Farmer has temporarily ceased operations. Hopefully we’ll see them back in business in the near future. Catch the Latin Farmer at the Arthur Ashe Youth Tennis Center on Sunday when a chorus of food trucks are to foregather there to benefit the Center. I׳ ll be there! 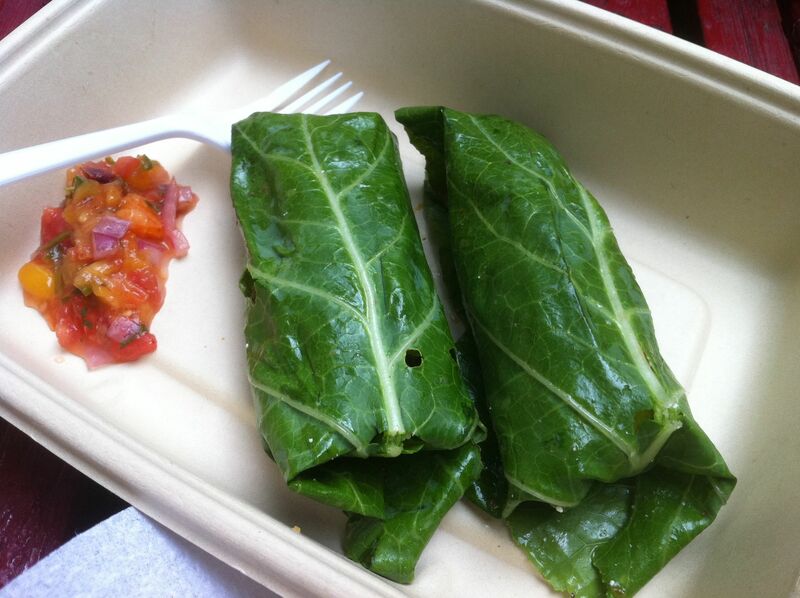 Oh my god, Just saying the word collard wraps makes my mouth water! They look delish!